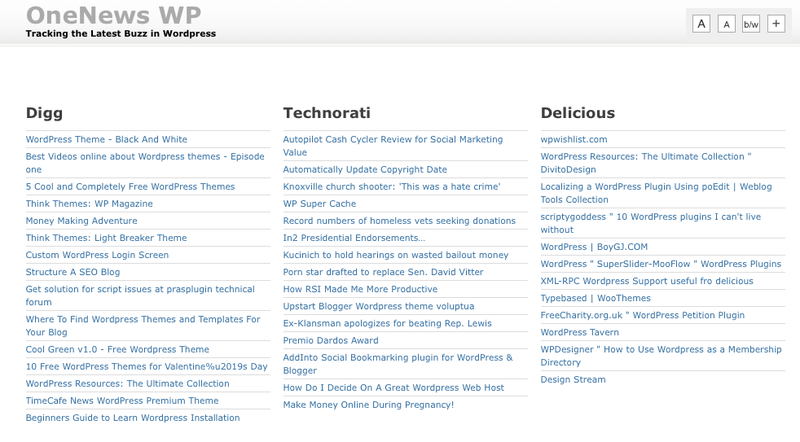 February 22nd in Premium Themes by Wordpress Jedi . If you have been online for a while, there is a good chance that you have heard of AllTop. AllTop is a news aggregator that allows you to track your favorite topics easily by tuning in to its feed pages. Those guys have done an awesome job of covering any topic under the sun. But as good as AllTop is, you can still find topics that are not covered on it (it’s not that easy!). Well, fear not! You can now create your own AllTop copycat WordPress site without really having to do too much programming. OneNews is a WordPress theme that allows you to create your very own AllTop copycat WordPress site in a flash. All you have to do is install the theme and add RSS feeds to it. Just like AllTop, feeds are classified under their respective letters. You can also show videos from YouTube, MetaCafe, and other video networking sites. OneNews uses SimplePie RSS to display the feeds on your pages. The theme is compatible with WordPress 2.7, and it supports threaded comments. There is no plug-in required to get OneNews to work. You are provided with 4 widgets (video, text, HTML, photo) that you can use to customize your pages. You also have access to tools to resize font, change background color, and share your page on social networking sites. You may also be worried about your link juice. Well, fear not my friends. You can nofollow links if you prefer. Verdict: A-. OneNews is a great theme for folks who are interested in running their own version of AllTop. And you can do it right from your WordPress blog. There are no plug-ins necessary, and you won’t have to spend a fortune to get it done (only $49). I would like to see recent visits page (like you see on AllTop.com), but that can be programmed (if you know your PHP). Now, before you go and create your AllTop copycat, know this: It will be tough to outdo those guys in what they do. You may want to go after topics that are not covered on AllTop. But for $50, you get one powerful theme to get started fast. Oohh – and thanks to Guy Kawasaki for tweeting about this! He did? haha 🙂 Thanks Guy! Guy did tweet this. It caused a stir but I think he has no worries as Alltop has the market here. Good review though! If you don’t want to go through the trouble of making your own Alltop, another cool way is to see if your favorite sites fit Alltop standards (they must be great if they’re your favorite, right? ;-). Or tweet any of the Alltop team: @guykawasaki, @neenz, @noe808, @noelleee. Fair point. AllTop does a great job no question. And creating an AllTop clone is not the only thing you can do here. Not that I know of 🙂 My writing style is too conversational for most blogs. It's a great theme and makes setting it up and being done super simple. I use it at http://most.recentufosighting.com and get great comments and exposure as a community resource. Only thing I want to do is change the 'addthis' icon to the standard set of icons. Maybe a Twitter button, a Like/Share button, SU, and maybe… I don't know. Maybe just those three.